The peculiar phenomenon of adding a permanent construction to a portable camper is worth a deeper look. 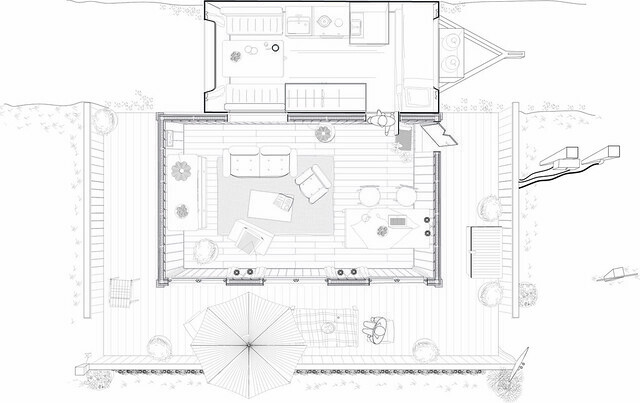 The illustrastion above show the typical camper+housing extension footprint. We will during the week try to develop some new prototypes of the permanent addition - that could attract new groups to camping life, as well as the existing values and the existing culture are preserved. - Most are designed as living rooms with a patio and fences around. - There is usually no toilet or kitchen in the hosing addition as most caravans are equipped with this. - 15 cm above the caravan, so as to create less distinction between the unit and houses. - A lot of theese extensions are self made (often) from left over materials. - Fire regulations require at least 3 feet between each unit, but due to significant gas-leak accidents a lot of campers practice a distance of over 5 meters between neighbouring caravans.